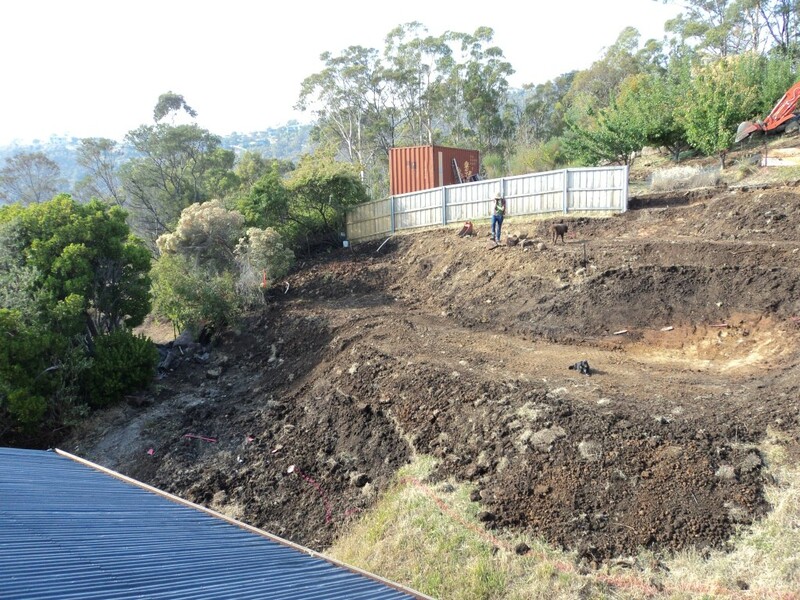 As we live on a steep slope we’ve had to build a lot of retaining walls in order to create functionalilty around access, water management and food production. 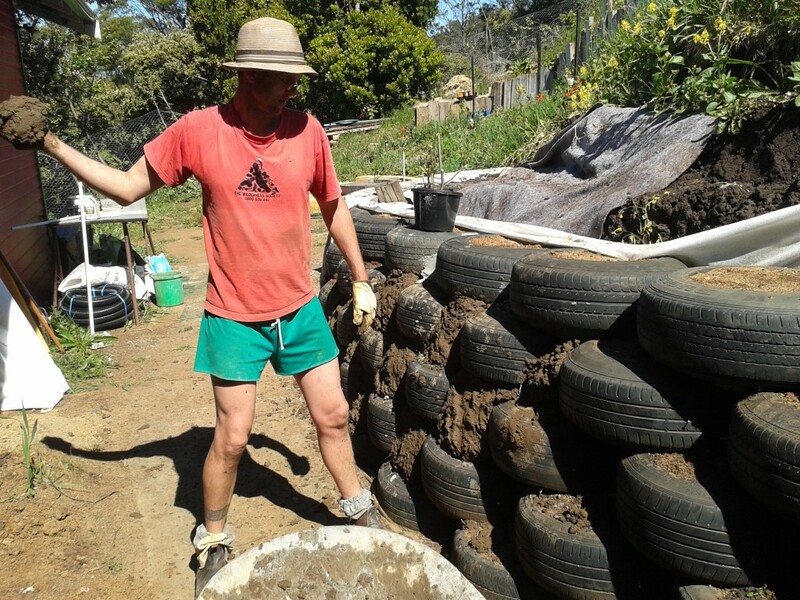 We’ve used a range of techniques to do this including working with old car tyres to build a big earthship retaining wall directly near our house. 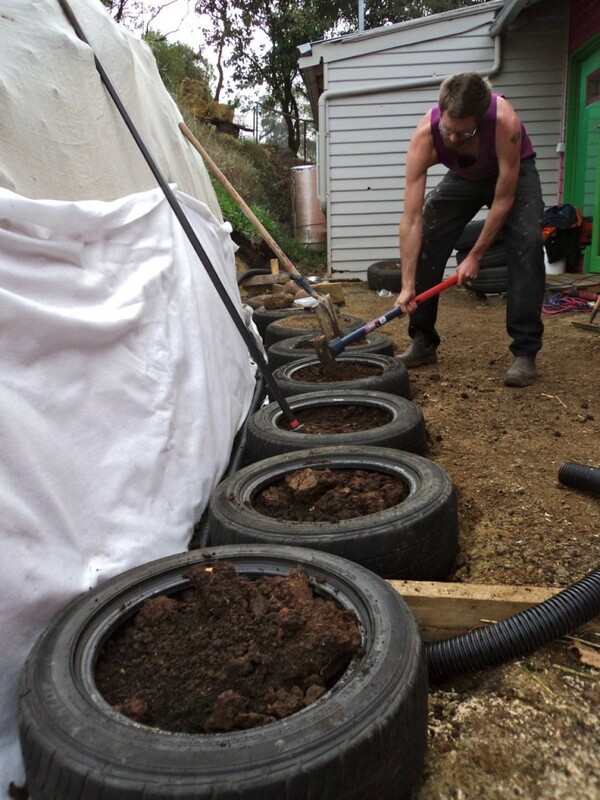 Earthship construction is a technique of building developed by Amercian architect, Mike Reynolds. He’s famous for using ‘rubbish’ and earth as building materials. We love his work. 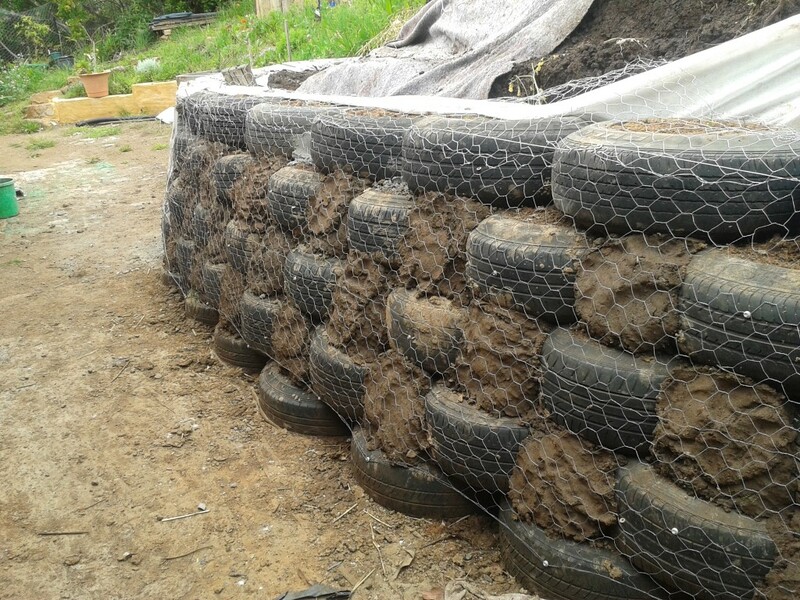 We chose to build an earthship wall as we had a small budget and a lot of excess sub soil left over from our initial earth works. 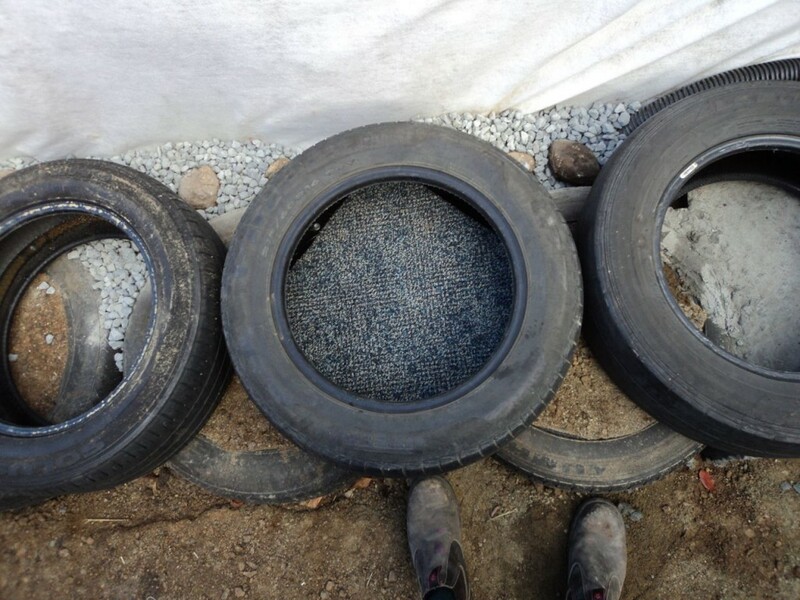 We also knew we could get car tyres for free from the local car yard who have to pay to get rid of them. We hadn’t built one of these before hand, so spent some time on youtube to learn how (there are lots of clips to watch). While it’s pretty easy, it’s also a lot of hard work. 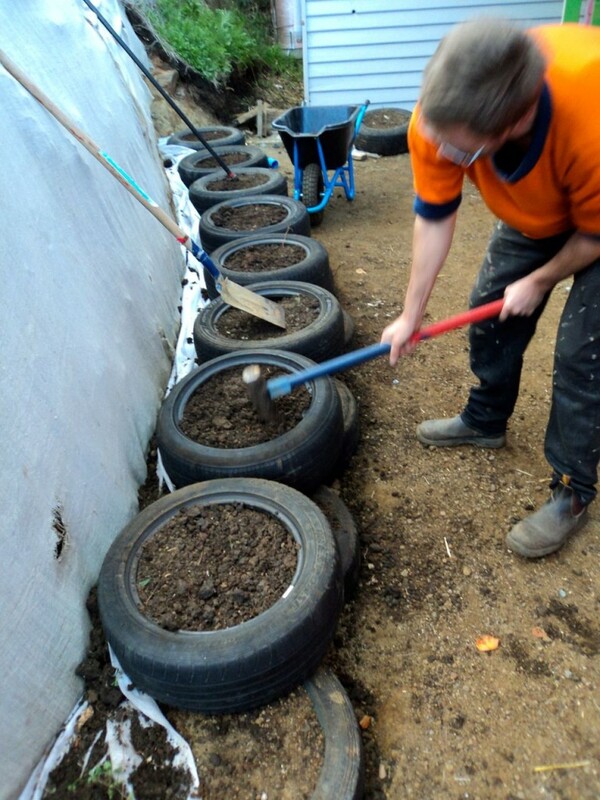 It would have been whole lot easier if we had heaps of people to help, one of these cool whakker packer tools and *dry* gravely soil instead of the wet, sticky/clay sub soil from our place. This last tip is a really big one, the guy on the youtube video we watched made it look like a walk in the park with his dry, sandy soil in New Mexico. 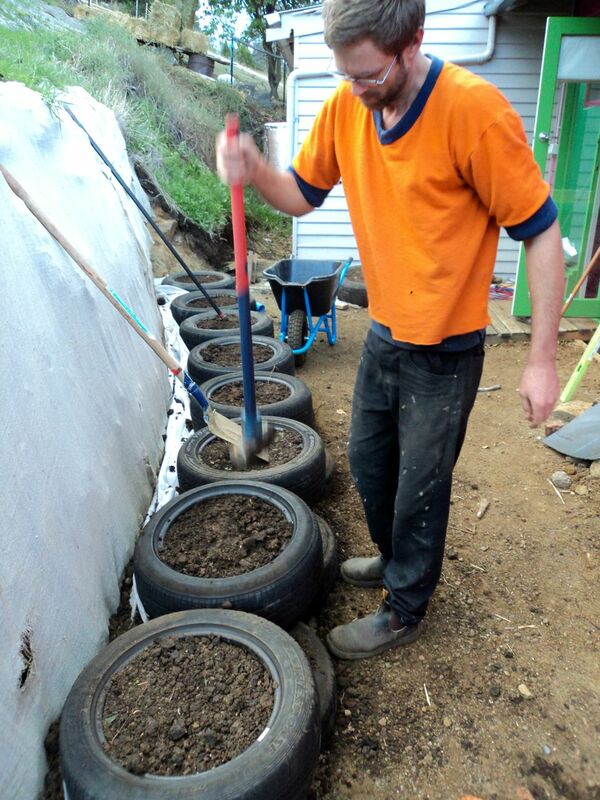 He just kind of poured it into the tyre and patted it down, in contrast we shoveled, packed, whacked, shoveled more, had a cup break to chill out a bit and then came back and whacked more. It was a bit of a mission. But it’s a bloody strong wall and used up a lot of our excess sub soil for which we are stoked. 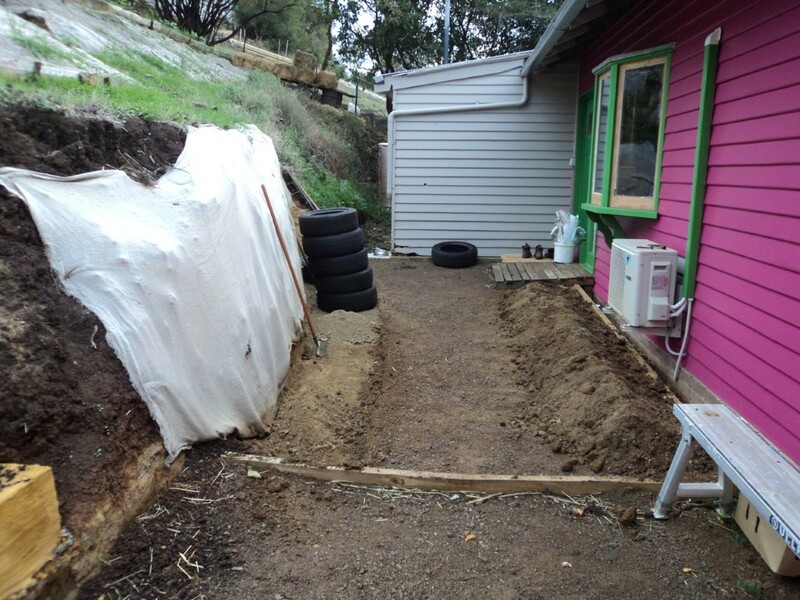 Starting out, we cleared the space, tacked on some white geo-fabric to the bank (see above) to keep it from dropping crumbs and made a level pad to start laying tyres. As we were almost on bedrock, we didn’t have to lay any sand/concrete for foundations, we just leveled it off. As soon as you start building up from your first tyre, you have to find a way to plug the holes so the earth doesn’t just fall through. We had a whole pile of carpet tiles the previous owner had left under our house which fitted perfectly, so we used them. 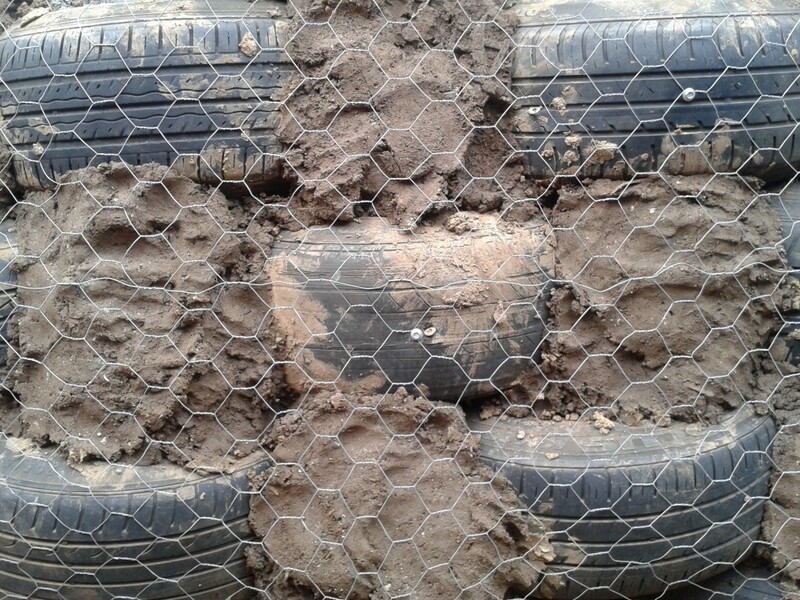 We also back-filled the area directly behind the tyres with 20mm blue metal and ag pipe (not pictured) to guide excess water out of this area to a safe spot. And when friends came to visit like Isobel did below, they helped, thanks Isobel! Pound, pound, pounding…. There was a lot of this and Anton did most of it so he is forever the best. We went five tyres high and angled them all slightly back for structural integrity. An important thing to note is that if you go over 1 metre high you need an engineer (in our region at least) to design/approve things which can get complicated and expensive. Because of this we didn’t exceed this limit – it might look taller below, but that’s because the earth around the wall had been excavated and we the paving hadn’t been put down. The next step involved plugging the holes with subsoil, the best approach was to simple form balls of sticky soil and peg it (throw it really hard) into the gaps and then pat it in to make sure it’s all bedded down. After that, we wrapped the whole wall in chicken wire, this is what the external renders ‘hangs on’ to and helps create a smooth, level surface. This is where I should have some photos of the concrete render layers we did (there were two), except I accidently deleted them all, so you’ll have to use your imagination. We chose concrete render instead of earth for two reasons, the first being this wall is in the coldest, dampest area of of whole property so it needs to be able to handle long months of never seeing the sun and being constantly wet. The second reason is that we’re not overly experienced with earth building, so took the conservative approach. Recently we (as in, Anton) did the paving around this area using recycled bricks being pulled up from our local town square. This was the final job to do before we painted the wall to look all fancy. So now it looks like this, which we love. Note the drainage holes at the base of the wall. In additional to all the 20mm blue metal and ag pipe that’s behind the wall these are also necessary as you *never* want any water building up behind a retaining wall. 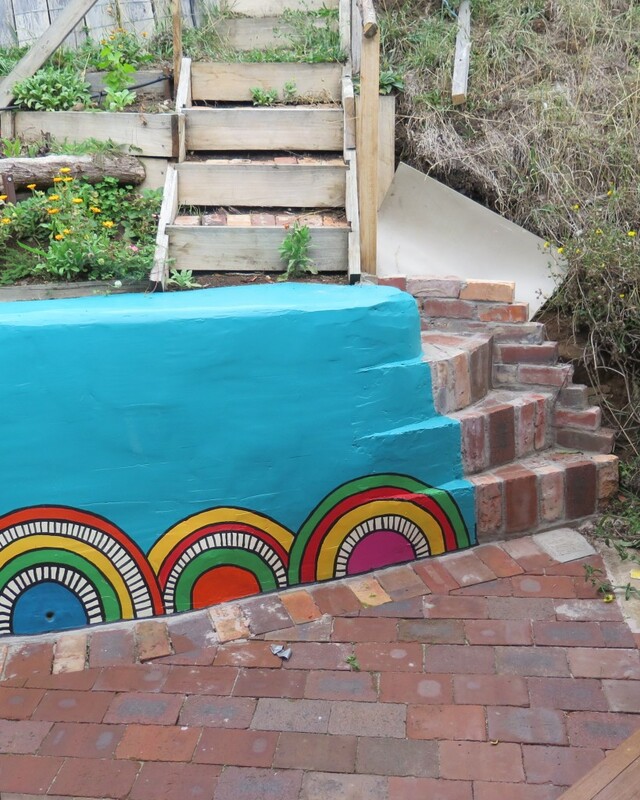 One end of the wall has these nifty little steps leading up to our food gardens (not pictured). The downside of these nifty stairs is that our little Frida Maria loves climbing them, when you’re not looking she’ll be up there in 2 seconds having a great time. Which is good and all, it’s just that the potential of falling onto the hard bricks below is a little too un-relaxing for us. So a little gate may be in order. 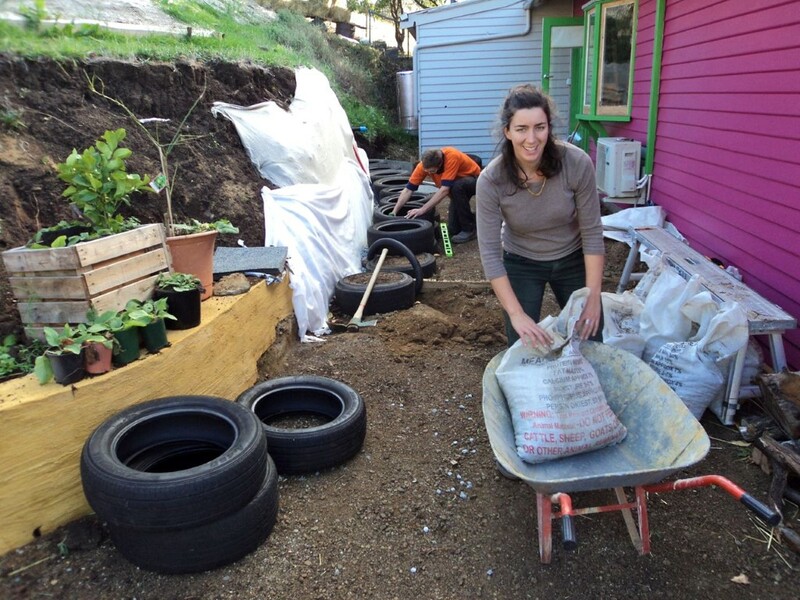 We’re looking at doing some more retaining walls this year for another part of block, and while we love this wall – we’re considering using earth *bags* this time round to save our backs :-). 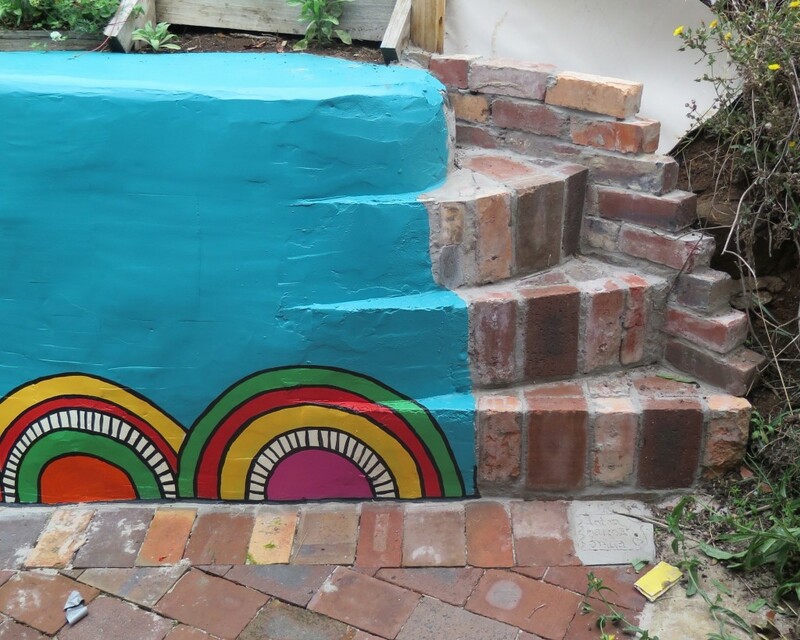 We’d love to see more people using recycled materials to build with inside and outside of homes. The amount of ‘rubbish’ in our world is mind boggling and when we look closer at so called rubbish, you’ll notice that most of it could actually be re-purposed into a valuable resource. 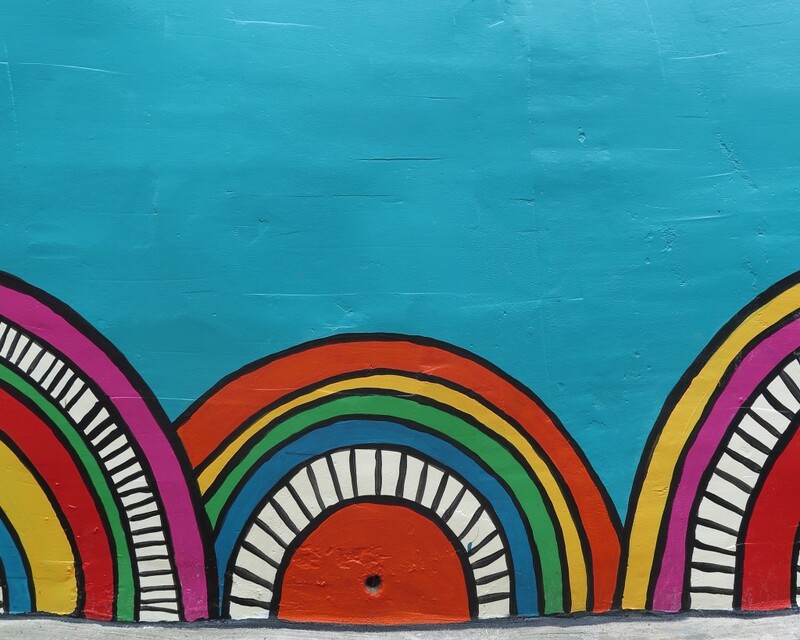 The possibilities are endless – it’s just needs you/us to pull our socks up and get creative! 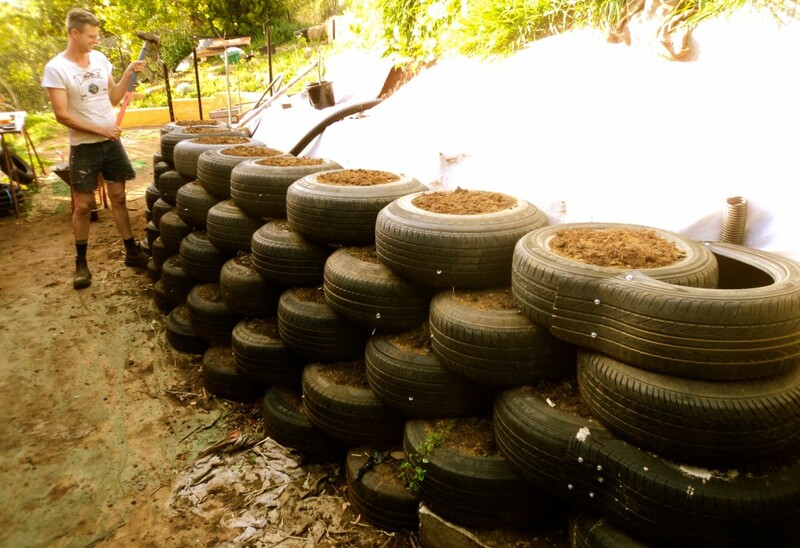 *Just a quick note, car tyres can have some leaching of chemicals which we wouldn’t personally be comfortable putting near food gardens. So this wall isn’t near our growing beds. Everything downhill from it (the leaching will move with gravity) is all brick paving and house, so we’re happy. Wow, now that looks fab, Ive never seen something so beautiful and functional. Well done to you all. 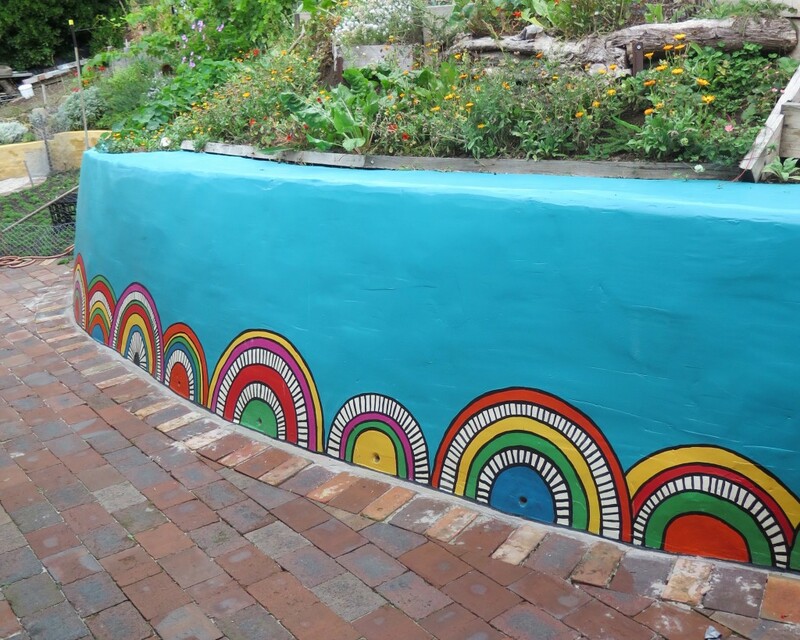 It has given me loads of ideas for what I could do to our railway embankment. Thank you for posting and being able for me to find it. 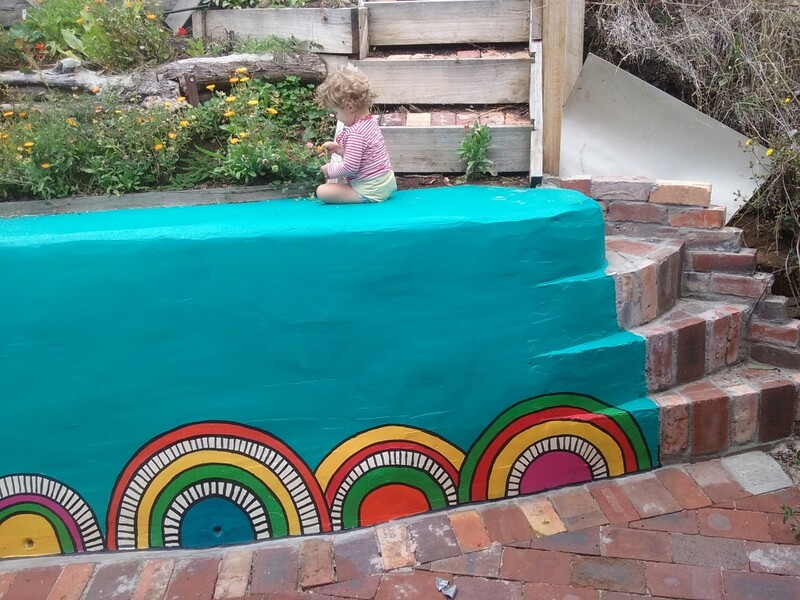 Pleasure Sue – good luck with your own embankment! How much time did you spend levelling the ground for the first course. It seems like as long as the ground is somewhat level the ‘fine tuning’ can be done in the filling of the first course. Is this the correct assumption? Hi Trudi, we made sure the ground was level before building. Saying that, building with recycled materials is never 100% perfect, so as long as you take water flow into consideration and that it’s structurally sound I’d be comfortable with it not being perfect :-). Hi, your project has inspired me. I am interested to know how long your project took to complete? My property is also sloppy and I am thinking of attempting to build a Tyre wall and hoping to create a serious of terraces. I was initially worried about the fire hazard the tyre will pose but this hazard is eliminated by rendering the structure. Thank you for posting this! We built this wall over some months as we had the time on weekends and the energy. 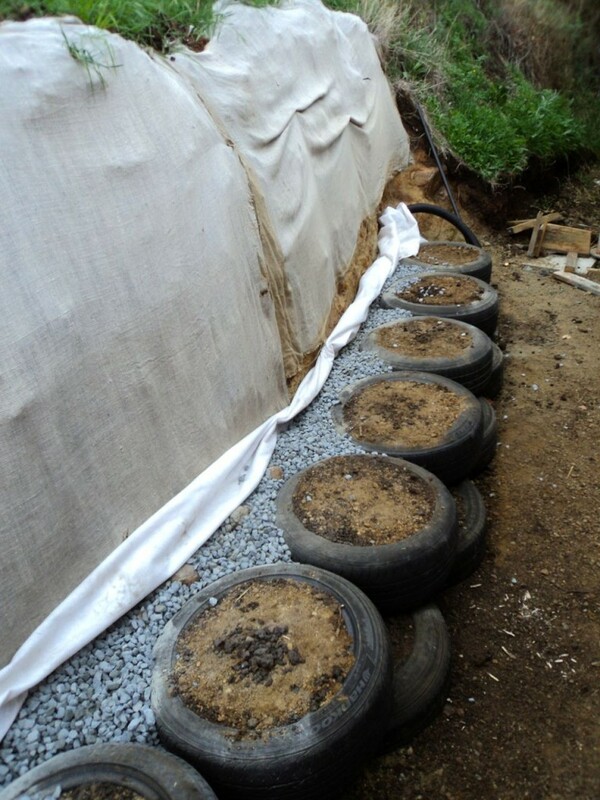 You could build it much quicker if you had a solid chunk of time and non-sticky heavy clay sub soil as the filler :-).